When I started working from home full-time a few years ago, I noticed I was starting to get pain in my hand, wrist and arm from using the computer. In prior years working in IT, I never noticed this as much because I was constantly getting up and walking around the office to help users. Now that I was at home sitting all day long, the consequences of using a mouse and keyboard were starting to surface. After a visit with a physical therapist, I got some good advice to improve the ergonomics of my office situation. I have made several changes to my equipment and also have tried to change my behavior when working. Certainly it goes without saying that these changes may not help everyone and if you are suffering from pain while using a computer, you should consult with a doctor or physical therapist first. There is tons of information out there regarding ergonomics, I just want to share my experiences. 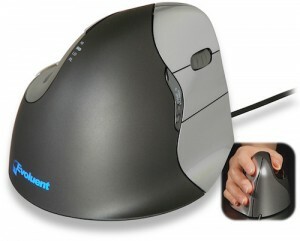 I switched to using the Evoluent VerticalMouse. The first time I saw this mouse, I knew that I would never like it. However, the benefits of using it can greatly help with any pains you may be having. This mouse is essentially a normal mouse but tipped up on it’s side to have your hand form a “handshake grip”. 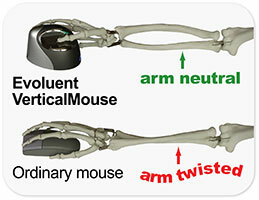 It avoids forearm twisting that occurs when using a normal mouse. It took me about a month to completely get used to using this mouse, but I definitely notice that it has contributed to a less pain in my hand, wrist and arm. Before I switched to the VerticalMouse, I tried out the Logitech TrackMan which is a trackball mouse (the newer model is the M570 Wireless Trackball). It was a nice change and I could tell it helped my wrist in particular. 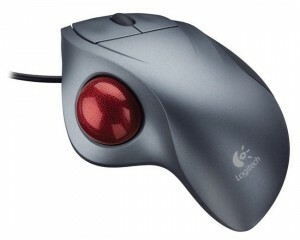 However, I did start to get pain on the right side of my hand and a little in my thumb from using the trackball. I will still pull out the TrackMan once and a while when I notice my hand hurting. It works well as a replacement to the Mac’s trackpad, since I can use it anywhere without having to worry about a mouse surface. I have found that switching between different input devices (VerticalMouse, TrackMan, laptop trackpad, regular mouse), seems to help with any pain. Changing your hand’s position and the different ways these devices make your hand move can aid in getting sore in the same places. I tried several different ergonomic keyboards that were split, had built-in wrist-rests or gel wrist-rests. These worked well, but these early models (and every keyboard I had used up till now) had either buckling spring keys or mechanical switches. In the last few years, buckling spring keyboards have become popular due to the satisfying clicky sound they make. Most keyboards today are either mechanical or scissor-switch (laptop keyboards). 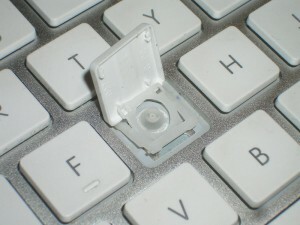 Mechanical keyboards require you to push the key further down and this can cause strain on your fingers. Scissor-switch keys do not require the keys to be pressed as far down and hence do not cause the same strain. I now use the standard Apple Keyboard with numeric key-pad. Since I have a MacBook Pro, I do enjoy having the same type of keyboard both at my desk and on the laptop. I have always been interested in the ergonomic keyboards, but it’s hard to find any that have scissor-switch keys plus have Mac versions. Microsoft has the Sculpt Ergonomic Desktop which does have scissor-switch keys, but there isn’t a Mac version. I think I will have to give it a try regardless to see if I like it. One of the recommendations the physical therapist made was removing the arm rests from my chair. This helps to stop you from resting your elbows on them and to promote better posture when sitting by keeping your arms at 90 degrees. The chair I had at the time just happen to allow me to remove the arms, so that worked out well. Another benefit of this is that the arm rests do not bump into the desk, which drives me crazy. 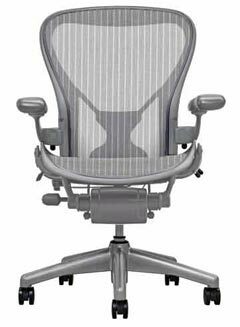 I have since gotten a Herman Miller Aeron, which is the quintessential office chair. It is definitely a great chair and since I spend many hours a day sitting at my desk, I feel that it is a great investment. The version I have does not allow me remove the arm rests, however I can position them all the way to the bottom and they are out of the way but are still there in case I want to use them. Swapping out my desk for something more adjustable was also helpful. I now use the IKEA GALANT which has since been replaced by the BEKANT. 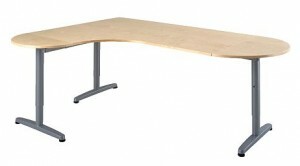 It has several different surfaces you can combine and most important adjustable legs have any surface height you want. Having good posture at your desk is crucial to avoid pain and soreness or worse injury. Jeff Atwood has a great post at Coding Horror going over good posture and the best way to position your chair, desk, monitor and keyboard. It’s extremely hard for me to be strict and have good posture while sitting at my desk. Eventually I will slouch or put a leg up underneath myself. I try really hard to notice when I do this and just get up and take a break (which I will go over in the next section). Working many hours straight at your desk without breaks can cause serious damage to your body. I try to get up and walk around and do something else at least every hour or usually even more often. This will also help me refocus on a project or problem that I have been dealing with. When I am on the phone, I will typically get up and walk around (or rather pace) which is still better than just sitting at my desk. The 20-20-20 Rule can also be a good guide to avoid soreness and eye strain. 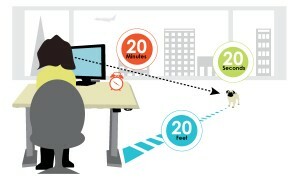 Every 20 minutes take a break and take your eyes off the computer screen. Take a break for at least 20 seconds. Look at something 20 feet away to avoid eye strain. When I’m taking my breaks, it’s a great time to do stretches. There are several hand and wrist stretches you can do to loosen up. I’ve also found it helpful to use stress/squeeze balls for my hands. Yoga is great for overall stretching and releasing tension. There are many poses to try and each can be good when focusing on certain parts of your body that need it. Sitting all day long can contribute to soreness, so I also mix up my day by standing and working on my laptop. We have a tall table in our kitchen and a tall dresser that I will stand at and work. There are many studies on both sides that sitting all day long or standing all day long will cause you problems. I find it’s best to just do both. It’s also nice to break up the day in different parts of the house. It’s hard to do everything correctly all the time when using the computer. It’s best just to try different things and be aware of your body and what it’s telling you. If you do that, then you can hopefully avoid any soreness, pain or injury.